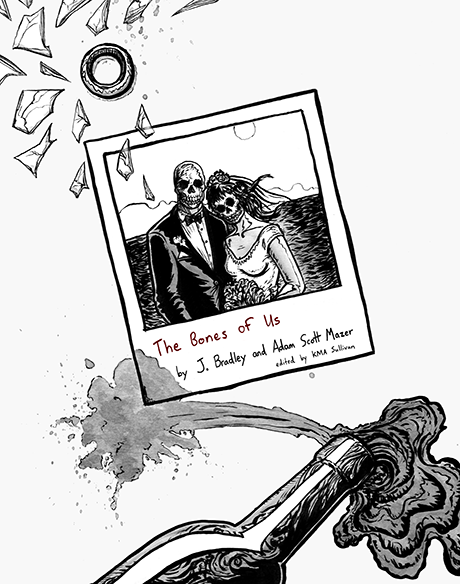 The melding of poetry and pen and ink drawings in The Bones of Us produces a visceral poetic narrative that kicks the feet out from under the happily-ever-after fantasy. Poet J. Bradley and illustrator Adam Scott Mazer joined forces for YesYes Books. It took a Kickstarter Campaign and a lot of drive to bring this experimental project to the public. Bradley and Mazer’s collaboration is arranged in two parts over seventy-five pages and includes thirty-eight poems. Mazer heightens Bradley’s urgent language with black and white illustrations reminiscent of Robert Crumb’s 1960-70s amped-up style and William Blake’s emotionally-charged seventeenth-century prints. Mazar also displays some of the macabre and bleak themes that Laurie Lipton has popularized: grinning skulls, souls in chaos, and intricate narrative scenes—definitely worth the time to really take in and revisit. For example, in “No More Merlot,” Mazar aptly accompanies the lines, “There are things about you I miss:/the rattle of your laugh, wine induced/courage. . .” with a chaotic scene of old photos and polaroids, scenes of past happy coupledom now in ruin. When couples break up, it’s worse for the one who still lives in the same place. Bradley shares this universal truth as a way to commiserate with others who can relate to one of life’s bittersweet experiences. It should be noted that the experience hasn’t matured to the bittersweet stage in the pages of The Bones of Us. The speaker is just not there yet—there’s too much venom and tears to be spewed first. The third section swings the vulnerability toward acerbic humor, “Facebook makes for a cheap private/detective. . .” The undertone of longing and loss soften the harsher moments that could individually come across as vindictive, but as the poems and images play back and forth they astutely reflect the emotional landscape of a broken relationship. Purchase The Bones of Us HERE. Reviewer bio: Kim Loomis-Bennett is a life-long resident of Washington State, besides a detour into Oregon where she met her husband. Her poems and book reviews have appeared in The November 3rd Club, The Copperfield Review, Poet’s Quarterly, and Hippocampus Magazine.Her recent work is included in The Prose-Poem Project. One of her poems is also featured on the Washington State Poet Laureate's blog at http://kathleenflenniken.com/blog/. She graduated with her MFA in May 2014.